A neutron star is one of the possible endpoints of stellar evolution. A neutron star, with a mass of 1.4 to 3 solar masses, forms from the collapsing core of a massive star immediately following the star's exhaustion of its fusion energy reserves. With the outflow of radiation from the stellar core suddenly switched off, the core can no longer support the overlying layers against the inward force of gravity. The rapidly mounting pressure of the infalling layers squeezes the electrons and protons of the core together to create neutrons and neutrinos. The neutrinos immediately escape into space but the neutrons crowd closer and closer together until they reach the density of an atomic nucleus. At this stage, if the compressed stellar core is less than the Oppenheimer-Volkoff limit of about 3 solar masses, the neutrons are able to resist further collapse. Otherwise, a black hole forms. 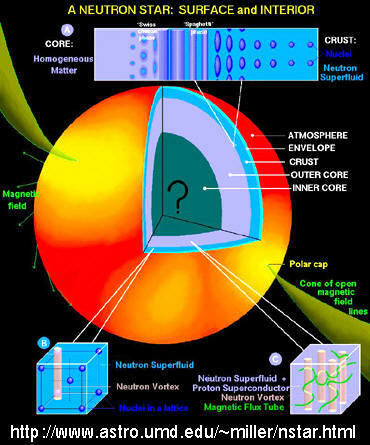 The star's collapsing middle layers rebound against the newly-formed solid neutron core. This generates a shock wave which heats and blows off the surface layers as a Type II supernova explosion. Left behind is a rapidly spinning neutron star which has a strong magnetic field with poles that are usually aligned with the pole's of the star's rotation. Two oppositely directed beams of radio waves escape from the poles and sweep around like a lighthouse beam, producing a series of regular radio blips that can be detected from Earth. The result is a pulsar. A neutron star is typically only about 20 kilometers (12.5 miles) across, yet within this small region may be over 2 solar masses of material. The result is a gravitational field at the surface of a neutron star about 70 billion times stronger than that on Earth. Neutron stars have a density of about 1014 grams per cubic centimeter, or roughly a million times that of white dwarfs, so that a sugar-cube-sized sample of neutron star would outweigh the human race. Strangely, the higher the mass of a neutron star, the smaller its radius (gravity pulling the contents in ever more tightly). In structure, a neutron star more closely resembles a solid, miniature planet than it does an ordinary star. Its core consists mainly of densely-packed neutrons, with a sprinkling of protons and an equal number of electrons, in a liquid-like state known as neutronium. Surrounding this is a mantle topped by a crust, perhaps 1 kilometer thick, consisting of a stiff lattice of nuclei of the same elements as found on Earth through which flows a sea of electrons. The highest possible "mountains" (surface irregularities) rise to a height of about 5 millimeters (0.2 inch), while electrons and heavy nuclei evaporate in the surface temperature of 8,000°C to produce an "atmosphere" maybe a few micrometers thick. As a neutron star cools and shrinks, strains develop in the crust so that it buckles, causing starquakes. Such events are marked by glitches in the otherwise remarkably steady periods of pulsars. Life either on or in the vicinity of neutron stars may seem extremely unlikely. However, planets have been found around pulsars (see pulsar planets) and the possibility of life on a neutron star has been considered by Frank Drake and explored in fictional form by Robert L. Forward.